Adam Sorg is a mildly successful artist; I mean he has a nice house on the beach and a pretty gal. Adam is upset though because a local art critic has informed him that his work lacks true color. Adam’s found that color however, and wait till you see what he paints with now.. 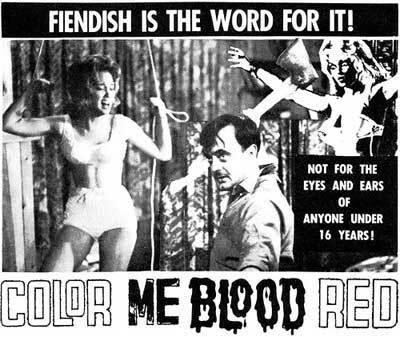 In the 1960’s Herschell Gordon Lewis took horror fans to places they had never been before. His movies, though they were extremely low in budget, showed teenagers of the day sights they only saw in their imaginations. No longer were there shots of knives being swung; now we were able to see the knives tear into the soft pink skin and spill gallons of blood right before the viewer’s eyes. To top it all off the films were in color!! Who cared if the cast was horrible, these were the first gore films. 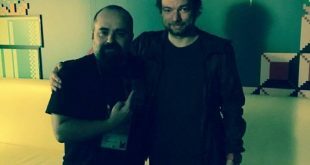 Lewis’s films are recognized by genre fans the world over, some have already found their way to straight to video remakes (2001 Maniacs! 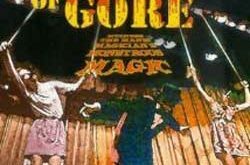 and The Wizard of Gore respectfully) a feat I’m sure Mr. Lewis is quite proud of. For Christ sakes he was even name checked in Juno! 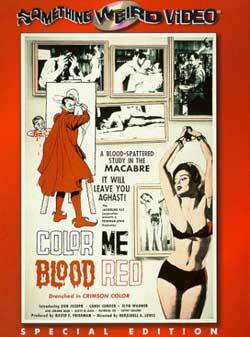 Color Me Blood Red is actually part of what many refer to as the blood trilogy (Blood Feast and 2000 Maniacs! complete the series obviously). The story behind Color Me Blood Red is about an artist named Adam Sorg. Adam is mildly successful or at least that is what we are lead to believe, the paintings you see throughout the movie are really not that great and most are extremely different styles from each other; this gives you an idea of the budget we are working with. Like most of H.G. Lewis’s characters Adam is very over the top. He is prone to violent fits and the destruction of his own artwork. After a snobby art critic informs Adam during an art show that his work with color is so much better Adam determines to fix his problem and become the successful artist he knows he can be. His home life however complicates this, you see although Adam has a smoking hot babe as his girlfriend the two of them obviously can’t stand each other She even tells him that the first thing she would want if they were married would be to have a divorce. Ah the love life of an artist in the 60’s. After the art show Adam sets himself up to create a wonderful new art piece. He gets frustrated in the middle of it and smashes yet another canvas and just leaves it on the floor, no wonder his girlfriend hates him. Speaking of the girlfriend she gets up in the middle of the night and sees the mess, she reaches down to pick the broken canvas up off the floor and cuts her finger on a loose nail sticking out of the wood. She attempts to clean the blood off her hand by wiping it on the canvas and then returns to bed. The next morning Adam wakes up and sees this wonderful new color on his canvas. His girlfriend informs him that she cut herself and that she is sorry that she bled on the canvas. Adam isn’t mad however he pulls her hand closer to him and reopens the wound. He begins to rub her bleeding finger on the canvas as if it were paint on the brush, of course the girlfriend freaks out (who wouldn’t) and informs him that if he wants to paint with blood he should use his own. Adam then begins to cut himself, he uses the blood on the canvas and still isn’t quite satisfied. He goes to add some actual paint to the image but he finds that the loss of blood makes his hand too unsteady, he can’t paint like this, but he needs more of that wonderful color. His girlfriend comes in at the right time, but the wrong place for her. Her constant nagging has finally reached Adam’s breaking point and he stabs her in the side of her head. She dies and instead of putting the fresh blood on a pallet to paint with Adam merely drags her lifeless body over to the canvas and begins to paint using her bloody face, in a quite amusing scene I might add. Of course the next trip to the art gallery is different; everyone loves Adam’s new painting. People don’t care about the price they only want to own it, but Adam’s short fuse gets in the way and he snaps and replies that it isn’t for sale. You see Adam knows why the people love the painting; they love his wonderful use of that red color. There is only one problem you see, where is Adam going to get more blood so he can create more masterpieces? 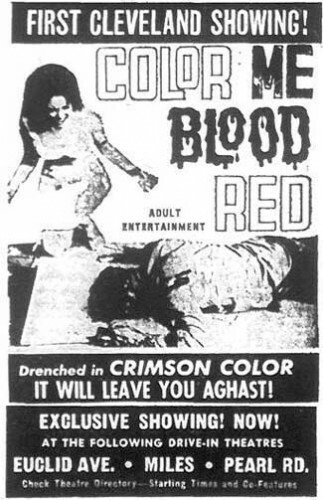 Color Me Blood Red is typical 1960’s drive in horror. 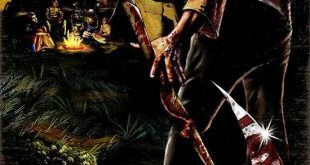 The cast is full of camp, the teenagers that are set up as would be victims are probably some of the strangest characters you will ever witness in the movie, seriously what is up with that one couple? The acting of course is horrible, almost on par with the acting found in most p*rno. Some of the FX are also laughable by today’s standards, but to fully respect a movie like this you have to go back to the 60’s this was new and fresh. 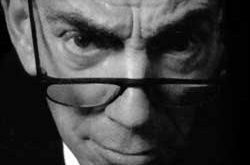 Without directors like Herschell Gordon Lewis there certainly wouldn’t be an Eli Roth (sorry new school fans) or a Sam Raimi. 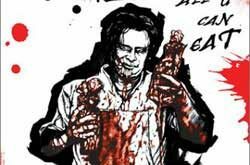 Color Me Blood Red is a fun trip to the past though and it comes highly recommended with a six pack of the beer of your choice.